AuthorMitaliPerkins: How does life in THE SHALLOWS affect the imagination? How does life in THE SHALLOWS affect the imagination? You know I'm a social media aficionado. I've been blogging since 2005. It's uncomfortable to admit for some reason, but I'm online for hours each day (except Sundays, when I strive to be screen-and-plug-free), surfing, reading, shopping, booking travel, doing research, answering email, playing Scramble or WordTwist, stalking friends and family on Facebook. One begins to wonder how this activity affects a writer's brain. There's nothing wrong with absorbing information quickly and in bits and pieces. We’ve always skimmed newspapers more than we’ve read them, and we routinely run our eyes over books and magazines to get the gist of a piece of writing and decide whether it warrants more thorough reading. The ability to scan and browse is as important as the ability to read deeply and think attentively. The problem is that skimming is becoming our dominant mode of thought. Once a means to an end, a way to identify information for further study, it’s becoming an end in itself—our preferred method of both learning and analysis. Dazzled by the Net’s treasures, we are blind to the damage we may be doing to our intellectual lives and even our culture. What we’re experiencing is, in a metaphorical sense, a reversal of the early trajectory of civilization: We are evolving from cultivators of personal knowledge into hunters and gatherers in the electronic data forest. In the process, we seem fated to sacrifice much of what makes our minds so interesting. I can see this in my own life. My thinking is more scattered and shallow, and my writing online comes in short bits and pieces. Now that I tweet and write status updates, it's harder to compose longer blog posts. This is scary, especially since I'm in the business of creating long, imaginative works of fiction. 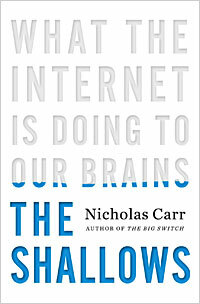 To write his own book, Carr confesses that he had to detach himself painfully from his Net addiction. I'm going to have to do the same. I've always tried to take Sabbath days once a week, staying away from screens and plugs on Sundays, but the time has come to preserve and nourish the depth of my imagination with a more proactive approach. How about you? We're not Luddites—we love the Net for it's wealth of community and information, and will continue to use it, but we need to give our brains space to rest, reflect, contemplate, learn, and dream. Got any ideas, habits, or practices that work for you? Interested in joining me in 2011 in an effort to keep our Net use within limits? Leave a comment below with a plan or idea, fellow addicts. I need your help.